Just in time for Coverings, we've created the Tile Installer Credo which consists of ten core tile installation beliefs. If you've been following this blog, you're probably familiar with them as these are principles we don't take lightly. These beliefs keep us up at night; they motivate us to be active in the tile industry and seek out every opportunity to make believers of all those who still doubt and don't follow the industry standards and best practices for installing tile. Here they are. Will you help us get the word out? 1. 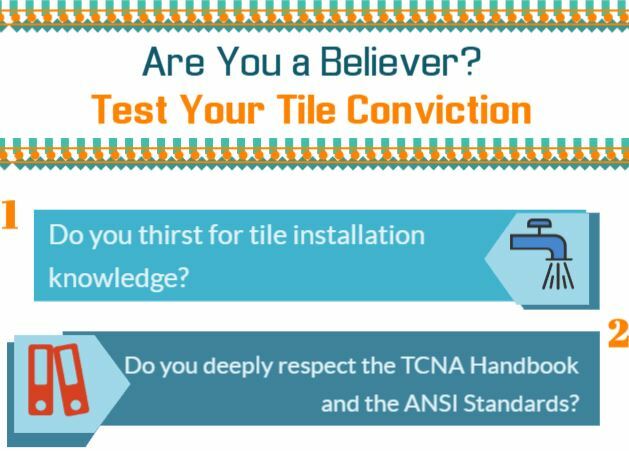 Do You Thirst for Tile Installation Knowledge? For most who become Certified Tile Installers, there's a deep thirst for knowledge that propels them. They want to learn more; perhaps they have doubts about installation methods they've used in the past and want to understand more. They routinely ask themselves why and how and regularly challenge themselves to be the best of the best. 2. Do You Deeply Respect the TCNA Handbook and the ANSI Standards? Fortunately, there's a way to quench that deep thirst! 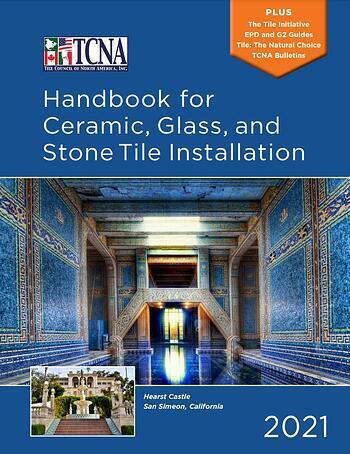 These core tile industry resources - the TCNA Handbook and the ANSI Standards - were developed to document the methods and standards for tile installation best practices. 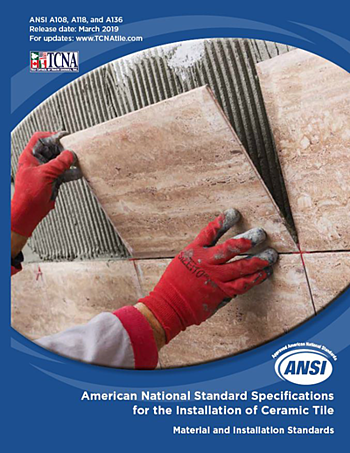 >> See ANSI Standards: A Tile Installer's Best Friend! Supporting this dynamic duo is the NTCA Reference Manual which was developed for and by the best tile contractors, manufacturers and industry experts in the country associated with the National Tile Contractors Association. These resources aren't set in stone. Rather, they evolve with the times, adjusting to new materials and techniques. You might think of them as expansion joints. 3. Do You Want to be Involved with the Top Tile Industry Installation Experts? Unlike many industries, the tile industry generates passion and commitment in those involved. Those in the industry naturally and enthusiastically participate whether it's sharing knowledge in online groups, participating in technical committees, volunteering to support CTEF as Regional Evaluators or helping at Coverings, and setting an example for the next generations of installation. 4. Do You Want to be Known as Qualified Labor? Are You an Installer Who Creates Installations That Last, Perform Beyond Expectation, and Look Great for Years? Certified Tile Installers have higher expectations for themselves and their installations. They make the argument for Qualified Labor come to life. They stand behind their work because they know that their heart, mind and soul have gone into it. It's a matter of pride that the work outlasts them. 5. Do You Want to Belong to an Elite Group of Installers and Help Those Who Haven't Yet Embraced the Right Techniques? Certified Tile Installers intuitively understand that they stand on the shoulders of giants and owe it to them to do everything possible to bring less knowledgeable installers up to the same level. The entire industry does better when standards and expectations rise. Not to mention that it's considerably more fun and interesting to involve the next generations. Without them replacing retiring craftspeople, the tile industry will suffer. 6. Do You Hate Five-Spotting, Winging It, Shady Cash-Only Deals and Fly-By-Night Operations? If you're Qualified Labor, you're a professional. As a professional, you rebel against anything and everything that smacks of ignorance and incompetence. That starts with banishing tile placers (we can't call them tile installers) who use methods proven to lead to failures, are never prepared and use shady business practices. Five-spotting is code for complete incompetence. Buyer beware of fly-by-night tilers. 7. Do You Believe in Mockups and Proposals That Detail the Correct Methods and Standards? Professionalism includes being thorough, methodical and prepared. Mockups provide perspective for how the selected materials will look when installed. They also bring up technical challenges that you detail in your proposals along with the correct methods and standards to overcome potential problems. As a result, you have the opportunity to gauge expectations and gain agreement ahead of time for what the end purchaser of the project has in mind. It's always better to spend the time up front to get agreement than to encounter pushback afterwards and then have to remove and reinstall the questionable tile. 8. Do You Respect Your Clients' Expectations, Manage Your Time Correctly and Communicate the Unexpected Professionally? Mockups help with setting expectations and gaining agreement. Managing time is so critical that it's at the heart of the Certified Tile Installer hands-on test. Combine the two and you have a professional process for agreement over schedules and the "look" of the final project. That in turn provides you with the credibility for addressing the unexpected - which always occurs - before it happens. 9. Do You Strictly Follow Manufacturers' Directions? Let's face it: tile installation materials are changing quickly and becoming more complex. This transforms the tile installer into an artisan-chemist where substrate prep, site conditions, mixing instructions, water temperature, troweling methods and installation techniques are essential for a successful installation. You can't wing it! Manufacturer directions are as important as respecting tile installation methods and standards. >> See Do You Ignore Grout Manufacturer Directions? 10. Do You Trowel Mortar Correctly? We just mentioned proper troweling technique. We'll mention it again: be sure to trowel mortar correctly since it will affect the integrity of the installation. Pay attention to mortar direction, trowel size, having enough mortar to support and bond the tile, and making sure that you have collapsed the trowel ridges. And, if you aren't sure, check your coverage. What's the State of Your Tile Conviction? Are you a believer? Did you answer 'yes' to all these questions? If you did and you aren't yet a Certified Tile Installer, we strongly encourage you to consider doing so.